"So, you know, if we have someone in office that doesn't care about all people, then we won't go anywhere as a country. In my opinion, until we get him out of here, we won't see any progress." …Durant expounded on why he would bypass a White House visit, a ritual for professional teams coming off championship seasons. Durant believes the president has played a role in the escalation of racial tension in the United States and the public rise of white supremacists. “He’s definitely driving it,” Durant said. “I feel ever since he’s got into office, or since he ran for the presidency, our country has been so divided and it’s not a coincidence. When [Barack] Obama was in office, things were looking up. We had so much hope in our communities where I come from because we had a black president, and that was a first. 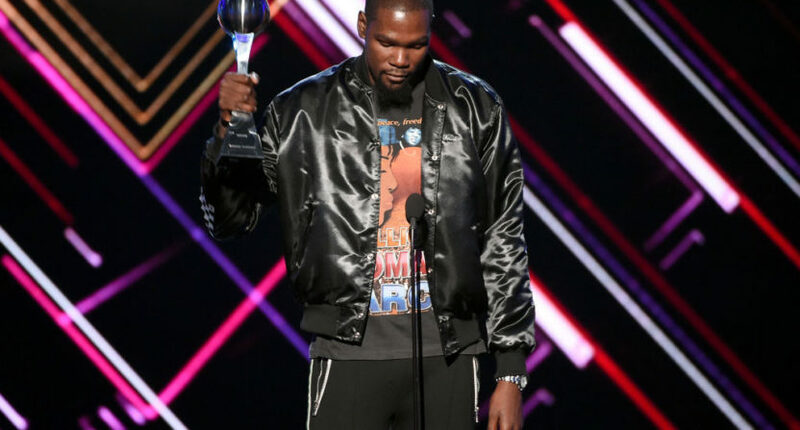 Durant (seen above accepting the Best Championship Performance award at the 2017 ESPYS) is far from the only athlete to take a hard line on Trump, and he credits several other NBA players for doing so as well, from LeBron James to Russell Westbrook. James in particular also came out with harsh statements on Trump this week, both on Twitter and then at a charity event Tuesday, where he called Trump “the so-called president of the United States.” But there have been many others who have joined in, with Steve Nash notably doing so earlier this week as well. Still, it’s particularly notable to see Durant so definitive that he’ll decline a White House invitation (many of his teammates haven’t committed publicly one way or the other), and to see him say “Until we get him out of here, we won’t see any progress” about Trump. Durant definitely isn’t sticking to sports here, and it will be interesting to watch how that’s received. Get ready for plenty of hot takes on this one.